Showing 1 - 1 of 1 Products for Engine Intake Manifold Bolt Set. Choose from grade 5 hex or socket head intake bolts or grade 8 bolts with twelve point smaller-than-standard head and flange, ideal for where space is minimal. 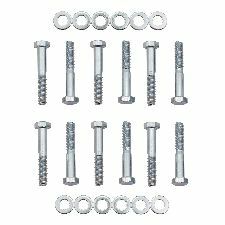 Bolts and washers are bright zinc plated for protection and appearance.